Warning, do not make confusions : J-M Le Guillou has been owner of Cybèle II (a Britton Chance Jr design with hull chines) for only ten days, because the boat was impossible to helm downwind. This boat has been straightaway bought by the FFYV (Federation Française de Y? V? 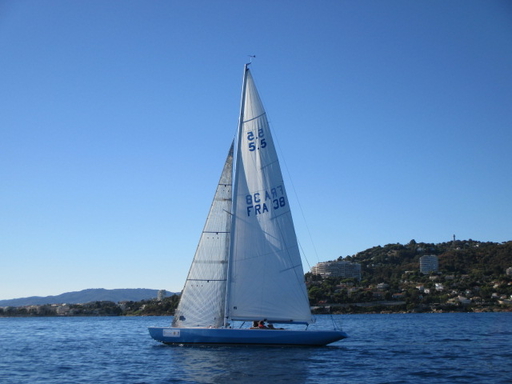 ), and Cybèle III has kept the sail number F-38. This is this last boat who became world champion in 1969. Source : Interview of J-M Le Guillou. Attention aux confusions : J-M Le Guillou n'a été que 10 jours propriétaire de Cybèle II, un Britton Chance Jr à bouchains, car le bateau était intenable au portant. Ce bateau a été aussitôt racheté par la FFYV et Cybèle III a gardé le N° F 38. C'est ce dernier bateau qui a été champion du monde en 1969. Source : Interview de J-M Le Guillou. World champion 1969 in Sandhamm with J.M. Le Guillou. See FRA-34 Cybèle I. It seems that J.M. Le Guillou has ordered two boats to Hermann Egger almost at the same time, that makes confusion in the stories of these boats. To compare the rating certificate would help.